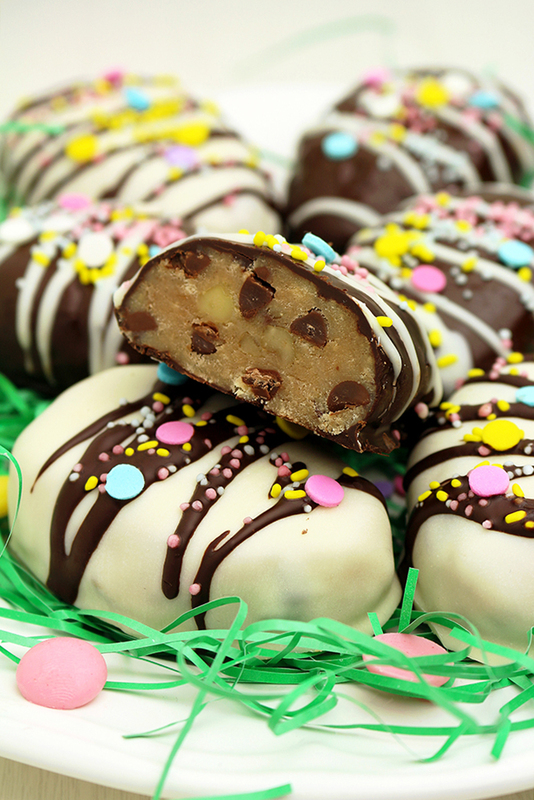 These Peanut Butter Cookie Dough Easter Eggs are a perfect choice for Easter dessert. Peanut butter + Cookie dough + chocolate = the best combination. 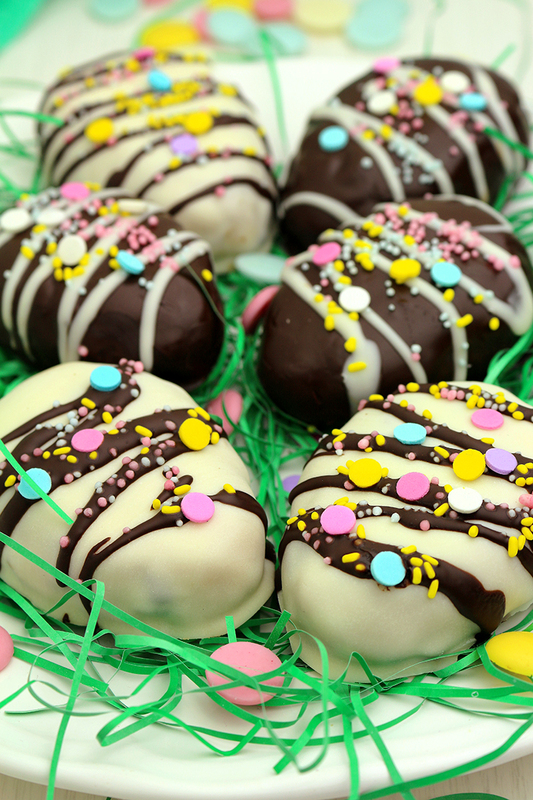 This perfect, egg – shaped mixture of flavors, covered with chocolate is decorated especially for Easter. Peanut Butter Cookie Dough Easter Eggs will be a great decoration for your table, giving it special, festive note. I love holidays. It seems like Christmas was yesterday and we are already thinking about Easter. Time definitely passes quickly. Plan your Easter dinner table on time. Can you imagine Easter without eggs? Decorating eggs is the most exciting part of this holiday. I love doing it with my son‘s help. We both enjoy those magic moments. Kids look forward to Easter and kids and candies go together. They will certainly like sweet home made Easter eggs. 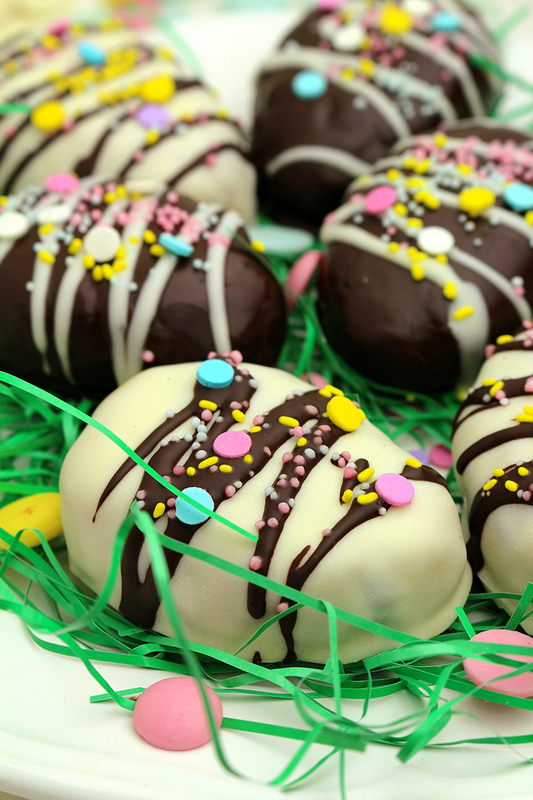 Peanut Butter Cookie Dough Easter Eggs take a special place on our Easter table. They are very easy to prepare and you won‘t need any special skills or experience to prepare them. 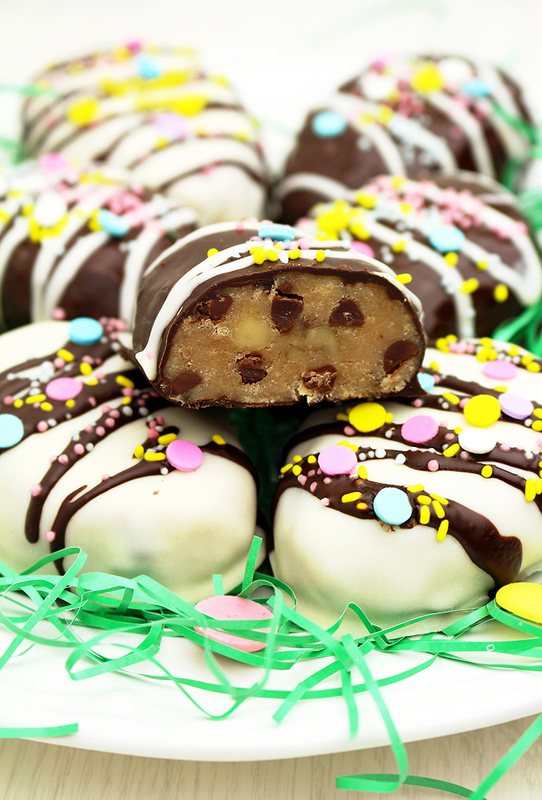 Peanut Butter Cookie Dough Easter Eggs are super tasty Easter dessert. You can decorate them in your own style, using candy melts in different colors. Let your kids help you; it will be a lot of fun. If you still haven‘t decided what to prepare, here are some more suggestions: Carrot Cake With Cream Cheese Frosting, Easter Shortbread Cookies, Fresh Strawberry Cream Cheese Cake anc Carrot Oatmeal Cookies. My family and I are looking forward to Easter and we can hardly wait to enjoy the holiday magic together. Happy Easter! 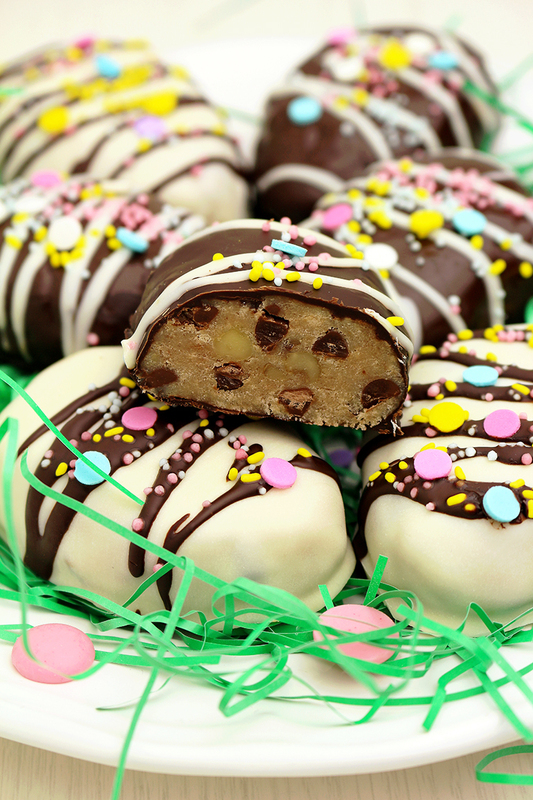 These Peanut Butter Cookie Dough Easter Eggs are a perfect choice for Easter dessert. Peanut butter + Cookie dough + chocolate = the best combination. Line a tray with wax paper. Set aside. In a large dish beat, at medium speed, butter, brown sugar and salt until it‘s light and fluffy, around 3 minutes. Add vanilla extract, peanut butter, condensed milk, milk and beat until well combined. Add flour and beat, at low speed until well combined. Fold in the mini chocolate chips and pecans. Scoop about a 3 tablespoon of dough and form into an egg shape. Repeat the same with the rest of the dough. Place the eggs on the prepared tray. Cover with plastic foliage and chill for at least 30 minutes or until it gets firm. Melt semi sweet chocolate or candy melts according to package directions. Dip an egg in the melted chocolate or candy melts to be covered completely. Take the out with a fork and shake for the extra chocolate to drain. Put it on the wax paper. Keep doing it until you use all the chocolate. Melt white chocolate or candy melts and repeat the procedure with the rest of the eggs. Drizzle with the chocolate leftovers and sprinkle with chocolate sprinkles before the chocolate hardens. These look so yummy! We can’t wait to try one.